Converted tabs are then computed in realtime into a set of navigation points in Cartesian space. The navigation points are determined smartly to account for slack in the system so that the arm moves smoothly and as quickly as possible. These navigation points are converted into 3 angles which correspond to the arm angles of the base, shoulder and elbow joints. Along with my teammate Evan Lowell, we rebuilt the robotic arm using metal components and phased out my original 3D-printed ABS parts. As the arm got heavier and bigger, the control problem also got harder. When the arm is short and light, servos do a fairly good job of keeping the arm in place accurately. As it gets heavier, servos start to have issues responding in a timely fashion. As it gets bigger, bias uncertainty of your control mechanism grows rapidly at farther distances from the origin. We solved these issues by utilizing smart navigation paths and good design decisions as mentioned above. Over time, we kept making revisions. Originally we were using a pulley system with double-servos to actuate the slide that presses down on frets. It was a horrible but necessary way to do what was needed to be done for the given resources at the time. We replaced that entire system with a pinion & rack system with a stepper for simplified controls and increased repeatability. A support was also added between two sides of the Cithara’s robotic arm along with replacement of single servo per joint with double servos per joint. We also made the decision to drop the adjustable clamp with a clamp we specifically designed and 3D-printed to hold picks in place. We both learned a lot merging music with elements of computer, electrical and mechanical engineering. 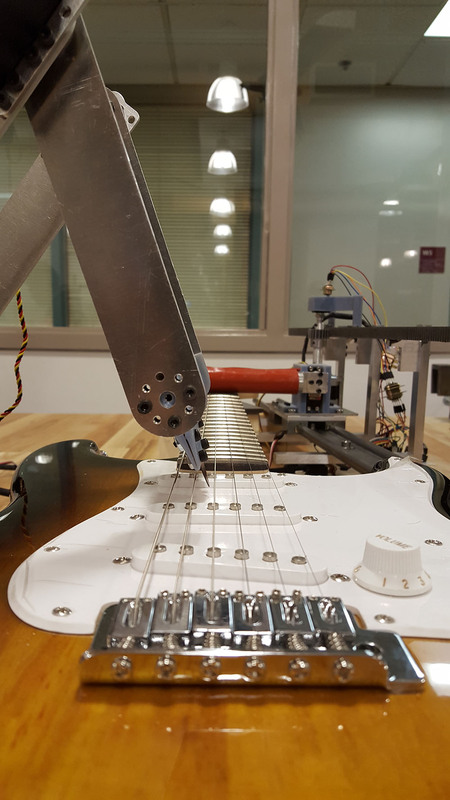 In future, we are planning to completely phase out the slide mechanism with another robotic arm that presses down on the frets just like a human player does. Thank you Tony Tang for your help with the initial robotic arm design and thank you Evan Lowell for always being a good teammate!